Description: Blue crown cap. White text: Marlen. 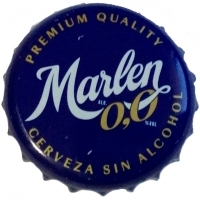 Gold text: 0,0 PREMIUM QUALITY CERVEZA SIN ALCOHOL.